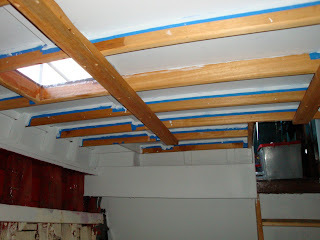 With the carpentry finished on the foredeck things have slowed down a little. heavy rain for the first few days of this week did not help either. 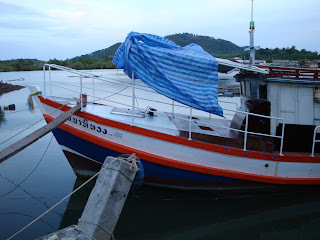 But Kao and Geng have been plugging away at the boat and I have spent as much time on board as I can. Saturday afternoon I got into the fibreglass covering of the new deck. First I had to seal the very bow part of the deck which is still traditional planks with big gaps between them. 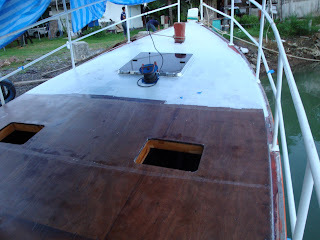 Gaps were filled with epoxy glue and then fibreglass cloth laid over the planks with epoxy resin. All the new work is getting a single layer of 200 gram biaxial cloth (suplied by Kevin of Solidair) and the bow section has that plus a heavy layer to give it good abrasion resistance when anchoring etc. I had a really sore back by the end of the day from all the bedning over sanding, cutting the cloth and applying the resin. Yesterday the weather got better so I did the second half in the afternoon. With a few lessons learnt from Saturday it was easier this time and Kao helped out which made it go that much quicker. Now the deck is epoxy sheathed and has one coat of high build primer. Inside the boys have been painting the engine room bulkhead and the underside of the new deck - beams will be varnished and the rest painted white with Jotun enamel. Kao has also been busy mounting gear and lube oil coolers, oil change pump, steering ram and alternator bracket. I took the exhaust elbow back to the shop and have extended it into a riser to reduce the chance of water finding it's way into the engine. Tomorrow we will insulate it and then it can go back on with some new salt water piping.